Shepherding is a dirty, tiring job. You’ve got to chase after sheep all day, and then you have to sleep with them at night. If a wolf is running after your sheep, you have to run out and tackle the beast and protect your flock. 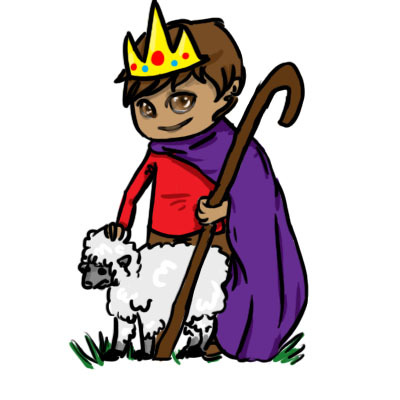 Can you imagine a king in velvet robes and golden crown running around in a muddy pasture chasing sheep? Well, today is Christ the King Sunday and we recognize that Jesus Christ is the Almighty King, ruler of heaven and earth. But the Old Testament reading describes the Lord God as a shepherd taking good care of his sheep. A king and a shepherd, those are the pictures we have of our Lord this Sunday. Good job, shepherd. (Sheep sit again.) Jesus wants us to take care of each other just like he cares for us. He wants us to feed the hungry, take care of the sick, and even help people who have done bad deeds. By caring for others, we care for Jesus. Every one of you can be a good shepherd. Prayer: Jesus, you are our Good Shepherd. Thank you for your tender care.